Every now and then there comes along a historically significant ground breaking project which just seems to connect on all levels of good sound business practice while creating an exotic tourist destination that the entire world can enjoy indefinitely. The "Vegas World Resort Kobe" is one such project which has set out to create a breathtaking new tourist destination of the absolute highest order. This $1Billion tourist destination is designed to not only offer the best in quality 5-Star luxury accommodations for the rich and the famous but is also designed to be affordable for the average family that may be on vacation but still want to enjoy the best life can offer. The "Vegas World Resort Kobe" restaurants, entertainment venues, shopping plazas, nightclubs, upscale "Timeshares", museums, along with it's extraordinary traditional and holistic healthcare, medical and fitness facilities will all but guarantee that everything our guests will ever need or desire will be available on the grounds of this immaculate waterfront property. Please take a moment to look at the official "Vegas World Resort" Kobe, Japan "Project Location Site Tour Video" shown above. The site is located on prime waterfront redevelopment land located on the Port of Kobe, Japan on the shores of Osaka Bay. All interested investors please fill out the "Contact Form" below for details. 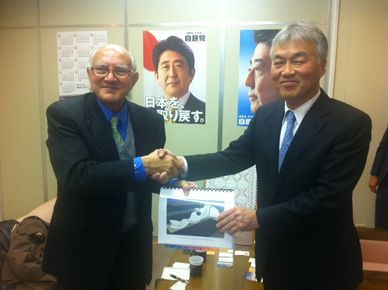 Vegas World Resorts, Founder "Simon Sahouri" Awarded LOCCA by City of Kobe, Japan Assembly Member "Hajime Ohno"
Final Note: Kobe, Japan is already a fully established international tourist destination with a very rich, vibrant nightlife that is populated by 1.5 million people. 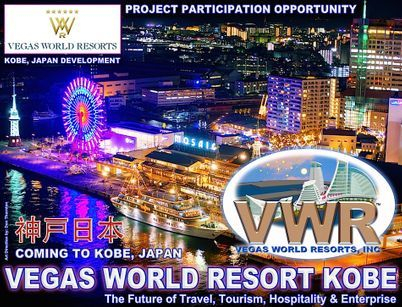 As you can see by the above video, Port of Kobe, Japan on the shores of Osaka Bay is a beautiful mixed use development that will be tremendously enhanced by our incredible "Vegas World Resort Kobe" 5-Star Marquee Tourist Destination. Vegas World Resorts, Inc. (VWR) is a USA Chapter-C corporation structured as a Holding Company for various projects that it is actively involved with on a global basis. Thank you for contacting us. We will get back to you as soon as possible within the next 24 hours.